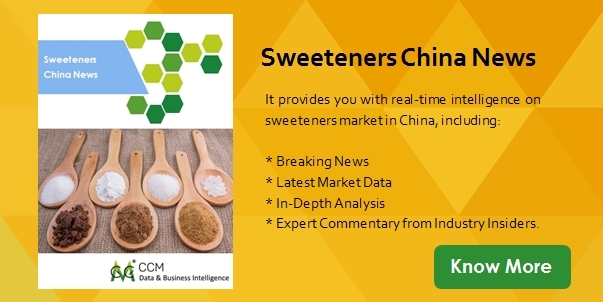 Summary: In 2015, the prices of stevia sweeteners declined constantly in China, mainly due to the sufficient supply of raw material and the follow-up price adjustment by stevia sweetener producers. As a whole, however, the market is still prospective this year, thanks to the increased demand from Europe and America. In 2015, the prices of stevia sweeteners constantly declined in China. In June, the ex-works price of stevia sweetener (RA95%) was USD106,197/t (RMB650,000/t), down by 10% over that of USD122,569/t (RMB720,000/t) in January. This is mainly because with a sufficient supply of raw material, the producers gradually adjusted the prices to meet the client enquiry. In 2015, the planting area of stevia leaf (centred in Gansu, Heilongjiang, Anhui provinces, Jiangxi Zhuang Autonomous Region, etc.) is estimated to reach around 10,000 ha (150,000 mu), a large rise over that of 3,333 ha (50,000 mu) in 2014. This, of course, guarantees the supply of raw material to the stevia sweetener enterprises. In 2014, the short supply of stevia leaf in the market led to the insufficient raw material for enterprises to produce stevia sweeteners, which then propelled enterprises to up-regulate the price of stevia sweetener (RA95%), from USD99,000/t (RMB600,000/t) in January to USD122,211/t (RMB750,000/t) in December. Such a skyrocketed price caused discontent amongst downstream clients. Now the price of stevia sweetener (RA95%) still stays very high, however expected to continue declining when large quantities of stevia leaves are put onto the market during June-September. "If the ex-works price is between USD99,000/t (RMB600,000/t) and USD106,197/t (RMB650,000/t), it is in a rational range", said an industry insider. Despite the price declines, the stevia sweetener market, as a whole, shows a bright prospect. This can be ascribed to the increased demand from the downstream markets in Europe and America. In 2014, both Coca-Cola Company (in the US) and PepsiCo Inc. (in the US) launched the stevia sweetener-enriched carbonated beverages onto the market. From then on, the enterprises throughout the world, especially from Europe and America have constantly put the-like new products onto the market, such as candy, beverage, biscuit and children's toothpaste. It is predicted that the global sales of stevia sweeteners will exceed USD500 million in 2015, up by over 5% YoY. Under such a circumstance, Ganzhou Julong High-Tech Industrial Co., Ltd. (Julong High-Tech) also intended to again join in the market competition. In H1 2015, Julong High-Tech increased the input into environmental protection and halted production for equipment reconstruction, expected to restart production this year. Julong High-Tech was ever one of the leading stevia sweetener enterprises in China, capacity given at 4,000 t/a. In 2011, many domestic enterprises expanded the production capacity, resulting in oversupply and sluggish market. Due to the simple product mix (only stevia sweeteners), Julong High-Tech presented poor risk resistance and thus encountered capital chain interruption. In June 2013, Julong High-Tech finished the equity reorganisation, from which the debtees holding USD99.67 million (RMB610 million) were transferred into shareholders. After 2-year development, as of February 2015, the bank loans and accounts payable were reduced by about USD17.97 million (RMB110 million) in total. CCM is the leading market intelligence provider for China’s agriculture, chemicals, food & ingredients and life science markets. 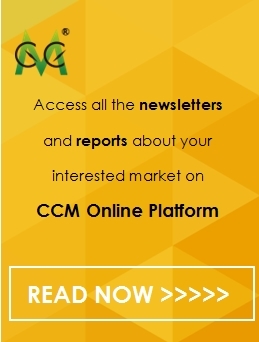 Founded in 2001, CCM offers a range of data and content solutions, from price and trade data to industry newsletters and customized market research reports. Our clients include Monsanto, DuPont, Shell, Bayer, and Syngenta. CCM is a brand of Kcomber Inc.
For more information about CCM, please visit www.cnchemicals.com or get in touch with us directly by emailing econtact@cnchemicals.com or calling +86-20-37616606.